Bristol Shipping Cases are designed to organize, transport and store your valuable equipment. We build our cases around your specific needs whether you’re shipping delicate electronics or bulky trade show displays. 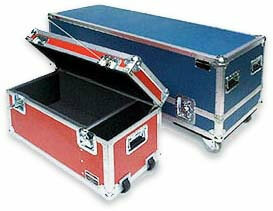 Our cases are more than just high quality packing cases; custom interiors help organize and protect your equipment. ABS or aluminum laminated fir plywood, split rivet construction and heavy duty hardware, mean you can ship with confidence. And when you’re not on the road, Bristol Shipping Cases provide the ultimate storage environment.